Today is the first day in ages that the sun is shining and it isn't raining. I've just cut these peonies from the garden and I'm really pleased with them. I thought I'd take the opportunity of sharing them with all my new followers. Welcome to my blog, it's nice to have you here and I hope you like what you see. 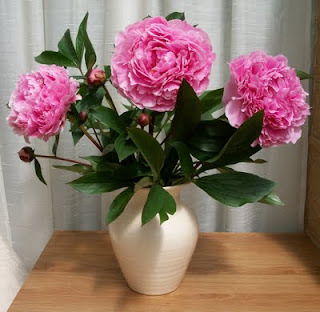 Thank you for the nice welcome--the peonies are beautiful!